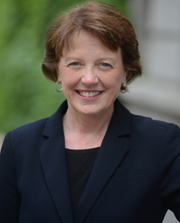 Mary Cunningham Boyce is the current Dean of SEAS, and as such, the Morris A. and Alma Schapiro Professor. She is the fifteenth dean of the school and the first female to hold the position. Her term began on July 1, 2013. Prior to coming to Columbia, Boyce spent twenty-five years as a faculty member at MIT. At the end of her time there, she was the Ford Professor of Engineering and Head of Department for Mechanical Engineering. Boyce's research interests include the molecular and nanomechanics of polymers, soft composites and soft tissues—studying the elastic, thermal and kinetic properties of physical systems at the nanometer scale. Her leadership in the field of the mechanics of materials, both those that are manufactured and those formed naturally, has expanded understanding of the interplay between micro-geometry and the inherent physical behavior of a material, which has led to innovative hybrid material designs. Models and results from Professor Boyce’s group have the potential to influence a range of industrial and academic fields from polymer processing to composite material design, tire mechanics, biological cells and tissues. Her expertise will further enhance Columbia’s strength in the study of nanotechnology and nanomaterials. The author of more than 150 publications with her group, she has received numerous honors in recognition of her achievements, including election as a fellow of the American Society of Mechanical Engineers, the American Academy of Arts and Sciences and the National Academy of Engineering. She is the holder of five US patents. Boyce earned her B.S. degree in Engineering Science and Mechanics from Virginia Tech and her S.M. and Ph.D. degrees in Mechanical Engineering from MIT. This page was last modified on 31 July 2013, at 16:11.